Q: (psyloaf) A while ago we heard talk of the playable First Officer system giving Captain powers to First Officers. Furthermore, there was talk of making Bridge Officers department heads that would provide bonuses. Are there any new updates on this front? Dstahl: As a player achieves the rank of Admiral, we would like the player to take on the responsibilities of developing and managing the ships under their command. There are several features that will be developed to represent this in game. One of those features is the ability to have your First Officer occupy a special, additional station on your bridge. We also anticipate Admirals being able to assign crew to ships in their command that can either assist the Admiral in space, or attempt their own special assignments. Look for these features when we get closer to increasing the skillpoint cap to Admiral. Q: (awesometific) It seems that the Klingon/Fed War story line has fallen by the wayside and there doesn't seem to be a reason for the factions to be separated. Are there any plans to either reinforce this story line or drop it all together and move the narrative forward? Dstahl: We plan to move the narrative forward over the next three seasons, starting with an indirect attempt by both factions to bring the Romulans to their side of the conflict. Q: (jmitchell76) The Jem Hadar Attack Ship – will we see it again in the Winter Event or will there be another chance at getting one? Dstahl: While we haven’t announced if the Jem’Hadar ship will be returning for the Winter Event, we do promise that there will be another chance to get one in the near future. Q: (russell1997) Is there going to be a better way to get Purple Mk XII ship consoles? Dstahl: We will continually add new ways to get items with each season. In Season 7, we are adding some brand new, as well as improved, MkXII science consoles in the Embassy Fleet Holding. Until then, Duty Officer Assignments and the Exchange are the current options. Q: (sakurus3005) Are more Borg missions planned and will there be new rewards related to STFs? Dstahl: A new Borg related STF, “Into the Hive”, is launching with Season 7 as well as the new Omega Fleet Reputation. As part of the Omega Fleet Reputation, you’ll have the ability to acquire new rewards being made to supplement the existing list of STF rewards. Q: (may72) I like the group missions at Starbase 24, but there are only 2 ground missions (Fleet Actions). Will there be more? Dstahl: A new 20-man ground Fleet Action which takes place on an overrun Romulan colony is coming in Season 7. We will continue to add more ground Fleet Actions in future updates. Q: (patrickkillian) Will there be a possibility to cancel running Fleet Projects? Dstahl: We are considering this change and may offer the ability in the future to cancel progress on Fleet Projects after they are in progress, however, it may be that if you do so, you will lose all progress and contributions that had been made to the project, while retaining your Fleet Credit. We are also looking into the issue where Fleets missed out on a Special Project due to another project being slotted. In either event, we do plan to re-run previous Special Projects in the future so if you miss one on the first go around, there will be a chance to get it again. Q: (xxxhellspawnyxxx) The requirements for T3 Fleet Projects are very high. Are you planning on adjusting the system for smaller fleets, e.g. depending on the number of members? Dstahl: We review the status of all Fleet Starbases on Holodeck regularly and have been adjusting project inputs and prices in some cases to find more balance given the progress different sized Fleets are making. In some cases, instead of reducing the inputs of projects, we have instead increased the abundance at which you receive inputs needed for projects. We will continue to adjust and monitor these numbers to ensure that all Fleets are making progress as expected over time. As we introduce a new Fleet Holding in Season 7, we will be making some additional adjustments on project requirements. Q: (prapilius) Will STO be added to the CORE Connect System with achievements, rewards, etc. or will it only be Raptr/Facebook? Dstahl: We are working with Perfect World to eventually move STO onto the CORE Connect platform so that we can share rewards and achievements across that platform. For now, there are some additional technology connections that need to be made between Cryptic and PW before we can make this happen. We do want to see cool new useful rewards as part of this system. Q: (icegavel) You've mentioned this "Reputation" system a lot recently. Any chance we could get a few details to chew on while we wait for its release? Dstahl: Certainly. We are introducing two new Reputations with Season 7 - Romulans and Omega Fleet. These Reputations will exist as a new tab on the status window. The system was designed at the same time that we created the Fleet System and so anyone who has used the Fleet Project contribution UI will be familiar with how Reputations work. Similar to Fleet Holding, Reputations will require projects where players will contribute items they’ve earned through gameplay towards advancement. Each Reputation has at least one unique input that is tied to mission drops and rewards. For example, the new Romulan reputation will require items that can be found by helping the Romulan colonists in Season 7 with all the various tasks they need done in order to secure their colony. Similarly, the Omega Fleet Rep will require items found in the STFs, including the new “Into the Hive” STF. As you rank up each Reputation, it will unlock new rewards at each tier. These rewards may include new passive and active Captain powers or even new equipment or officers. Unlike the Fleet system, Reputation rewards do not require provisioning, but instead require special projects that, once finished, can be used to claim an individual reward. In the future, we have plans to add more Reputations for other factions and political entities within the Star Trek universe. Q: (sc0ttish) Is there any news you’d like to share about a possible re-imagining of the exploration system in general? Dstahl: While we haven’t talked a lot about the exploration system, it is one part of the game that we do intend to address in an upcoming Season, and has been on my personal to do list for some time. We have been reading some of the fine proposals that have been posted on the forums as well as discussing the role that the Foundry should play in Exploration. The core concept is that exploration should involve heading out into the unknown, which means traveling into new sectors away from known space. In addition, exploration should offer a variety of gameplay other than just combat. As we look at the proposals on the table, the ones that are getting the most traction include new types of gameplay that allow captains to make choices and have strategies for how they approach the unknown. More than one of these proposals finds new purposes for Duty and Bridge Officers. We also see an opportunity for Fleets and Reputations to play a part in discovery. So while Exploration isn’t on the schedule for Season 7 or 8, it is something we are planning for and will implement as we continue to move forward in the game and past the current storyline. Q: (kekvin) Will we see a space invasion zone to go along with the ground version? Dstahl: By invasion zones, I’m going to assume you are referring to the Borg Invasion on Defera and the Tholian Invasion on Nukara. Both of these zones are large persistent zones with a variety of missions that scale in difficulty from easy to hard. We have started referring to these types of areas internally as – Adventure Zones. Thus far, these have been focused on Captain only gameplay on the ground. In Season 7, we are adding a third ground Adventure Zone, which will be slightly larger and the missions mostly different than the two previous zones. We will also allow Captains to bring along a bridge officer while on the surface, and a full away team when delving deeper into instances. To answer your question, in Season 8 and beyond we plan to take this design and begin building similar Adventure Zones in Space. Q: (predator423) will there ever be other ways of earning Lobi crystals besides from lock boxes? Dstahl: Some Lobi Crystals can be earned during Feature Episode Replay weeks, and we are planning on hooking up more Lobi to upcoming events. Q: (canis36) Has there been any consideration given to updating what we can craft by adding MK XII craftables and/or the special damage types such as the Plasma-Disruptor Hybrid, Polarized Tetryon, and Phase Polaron? I know there are a number of players who would love to be able to obtain weapons other than the two currently offered for those damage types. Dstahl: There has been some talk about adding additional ways to obtain these types of MK XII items, and the options are going to be either through a crafting update, or via a high tier project in the new Reputation system. Check out the new item creation projects in the Reputation System in Season 7 for more details. It might not have everything you’re asking about, but we are going to be adding these MK XII items over time. Q: (ghost2448) Could we have some more races and vessels from Voyager? Perhaps the Kazon, Malon, Vidiians, and the Talaxians? Dstahl: Eventually we do plan to start opening up sectors in the direction of the Delta Quadrant. Several of the races you’ve mentioned are on our list of potential enemies that would appear in those sectors, but we’re also considering the Krenim, the Devore, the Hierarchy, as well as additional Borg. There is a slight chance one of the Delta Quadrant races would appear in Season 8, but most likely it will be Season 9 or later before you’d see some more of the Delta Quadrant. Q: (bluegeek) Will the Reputation system tie into actual story mission content, or will it be more like the DOFF assignments, or like Starbase Projects? 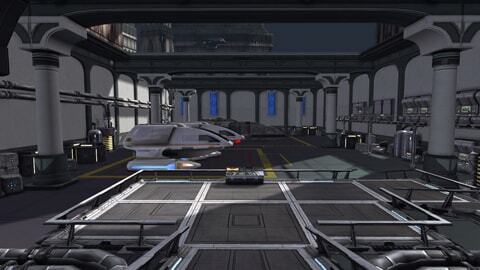 Dstahl: As mentioned earlier, new Reputation system will be similar to Fleet Starbases in that there are individual projects that must be completed in order to advance the reputation. Similarly, there will be unique inputs that can only be obtained by playing missions related to the Reputation. For example, most of the new missions in Season 7 revolve around the Romulans, and many of these missions offer items needed to increase your Reputation with the Romulans. In addition, as your Reputation with the Romulans goes up, new missions may become available. Some of these may tie into storyline plot points or provide more context for what the Romulans need help with next. Q: (njsjedi) What is a Captain to do with all this GPL we have got left over from Christmas? Dstahl: Rumor has it that the Ferengi have been negotiating some deals that will offer some new items for GPL this holiday. Q: (stomac) When if ever are we going to finally see customizable ground kits? Dstahl: This is one of the features that is being considered for Season 8, but hasn’t been finalized yet. We do want to get this feature out in the next year, so if it isn’t Season 8, then it will be sometime shortly after. Q: (connercrest) Is there an ETA on the Vesta Class? Dstahl: It will launch next month (November) on the same day as the release of Season 7. Q: (tilarium1979) Why do projects die as staff rotates out or take leaves of absence? 700-day veteran android, First Officer, Department Heads, Off-Duty clothing revamp, etc – all were close to being done, but then the person(s) working on it left the dev team (or on a leave of absence) and the project was scrapped. Dstahl: There are a couple reasons why you might think that some projects were close to being done and why they appear to be going nowhere. First of all, as a small team, every individual has a large amount of ownership over a specific area of the game. If any one person leaves, then there is a void that has to be filled by someone else. In the case of many of the items you mention, these were individual side projects that each individual owner had decided to add to their own schedule and had in some cases even communicated on the forums that they would like to “get that done sometime”. Many times, these are after work projects, or items never scheduled to be in the game, that the individual owners wanted to get done out of their own desires to answer player feedback. So when that person leaves, it is not always the case that the feature was anywhere near done, nor is it the case that they had communicated what their intentions where to begin with. We allow this level of entrepreneurial spirit on the team, but as I’m well aware, when you communicate what you would “like” to do, it can haunt you when it doesn’t get done. For the most part, the individuals who mentioned these features should not have done so until they were certain they could be implemented. That’s not to say that features like First Officer, Department Heads, and Off-Duty revamps will not happen. In an MMO, anything can eventually happen and I wouldn’t be surprised if these features are in the game in the future. But for now, they are on hold until someone else on the team picks up where the owner’s idea left off. Q: (derrico1) Could there be a way for fleets to see how much fleet members have contributed in the fleet roster area instead of the the contribution section? Dstahl: This is a great suggestion and now that we are adding multiple Fleet Holdings next season, it will be good to see an aggregate of Fleet Contributions across all holdings. The roster page seems like a good place to put this. Q: (generalkras) I was wondering as to the status of pure story drivern content in a similar vein to the original campaign’s plot arc and was wondering when we’ll see our next big story update? Dstahl: We will be continuing the story arc of the Romulans in Season 7 and Season 8 as well as introducing some new characters and plot points to help advance the primary campaign plot. In addition, we expect to see the return of Feature Episodes series starting in Season 8. Q: (jsalexan) Are you guys ever going to expand the system beyond Vice Admiral or is that it? If you are, is there a time-frame for this to happen? Dstahl: We do expect to add another rank and skillpoint cap in the future, and we have continued plans to introduce new ways for your Captain to advance their career. For example, the upcoming Reputation system is designed to offer Captains an alternate way to personally advance the skills and abilities of your Captain. Before we can increase the skillpoint cap, we want to ensure that Fleets and current end-game content is where it needs to be and then we need to build out all of the new max level content. We don’t want to increase the skillpoint cap and add new ship tiers until we have plenty of challenges to face to make it worthwhile. Q: (zeuxidemus001) Any chance we will get the account bound STF tech drops? Dstahl: The entire reward structure of the STFs is being revamped in Season 7 and being converted into the new Omega Fleet Reputation system. There will be an upcoming blog post that will explain the conversion that will be happening and how previous dropped items are being incorporated into the new personal advancement system. As such, the function of these items will be changing slightly and we do not intend to make them account bound, since they will directly be tied into personal advancement for the Captain who plays the STF. Check the website for more information about these changes as we get closer to Season 7.